Sales are tied to countless factors, from product quality and freshness to warranties and specific features. Each shopper ultimately prioritizes his or her needs, but within the complex web of consumer marketing, packaging plays a primary role in shaping buyer preferences. Television advertising, Internet marketing and even referrals from friends and family do not measure up to the impact created by product packaging. While these important concerns do influence consumer spending behavior, the point of sale is where the action is – often leaving product packaging as the sole persuasion drawing shoppers to choose one product over another. Despite its critical role, packaging is consistently called-out in consumer studies for not meeting buyers’ needs. Whether packaging household goods, health care products, or food and beverage items, research points to specific trends guiding the contract packaging industry into 2015 and beyond. Expectations have shifted among consumers, who now expect producers and other companies to take active measures ensuring sustainable, environmentally-friendly packaging practices are followed within their organizations. In fact, eighty-six percent of consumers surveyed indicated exactly that. According to responses gathered by the Carton Council of North America, the vast majority of consumers believe companies are responsible for helping to increase package recycling. The survey, which included responses from more than one-thousand adults, also indicated buyers expect manufacturers and packagers to provide environmental information on packages, to help users increase their own recycling efforts. According to the survey, seventy-five percent of respondents turn to product packaging as the first source for information about recycling. A distant second, company websites are the next most-used resources for determining whether or not specific packages can be recycled, drawing 31% of those surveyed to the Web for environmental information. In addition to recycling concerns, a majority of consumers favor product packaging that can be repurposed for other uses. And while environmental consciousness is found within every shopping demographic, affluent consumers are particularly tuned-in to green matters. As a result, earth-friendly practices furnish opportunities for packaging professionals to connect with desirable consumer markets. User feedback shows, at a minimum; recycling messages should be included on retail packages, using the recycling logo to call attention to producers’ commitment to the environment. For packagers, tremendous growth potential exists for using renewable packaging. Recyclable PET, for example, derived from natural building-blocks like sugar cane and other renewable substances, stands poised for dramatic growth, as packagers increasingly embrace bioplastics to address consumers’ green concerns. Diverse industries are represented within those dedicated to green solutions, including the telecom business, where AT&T paved the way with their plant-based accessory packaging. Renewable PET use is predicted to grow from current annual levels of 600,000 tons, to over 5 million tons by 2016. Packagers are increasingly tasked to create convenient packages, speaking directly to evolving consumer needs. Freshness concerns, for example, prompt food buyers to favor resealable packages they can open and close repeatedly without compromising quality. As a result, familiar resealable packages once associated with baby wipes are becoming the standard in other retail sectors, as well. In one example of the way consumers influence packaging choices, Kraft launched a resealable candy wrapper for its Cadbury brand. The flexible wrapper enables buyers to safely stow uneaten portions of each candy bar in its own original wrapper. Edible packaging furnishes another area for exploration, as companies are rolling-out convenient, edible designs. Stonyfield Yogurt, for example, sells yogurt balls encased in a flexible “skin”, which serves as “packaging” for the product. To remain hygienic, the balls are still wrapped with cellophane for retail sale. Single-serving sized containers cater to life on-the-go, so modern consumers will continue to embrace these convenient food packaging options in 2015 and beyond. Supplements and nutraceuticals are also packaged in single-dose sizes, making powdered energy blends and vitamins easy to consume on the fly. Other enhancements to food packaging, like on-package labels designed to give real-time feedback about food freshness are also positioned for widespread use in coming months. Given the growing popularity of Internet shopping, the retail landscape has changed for packagers. Closing sales increasingly involves shipping goods directly to buyers, who demand the most convenient access to retail products. As a result, the future of packaging will continue to lean heavily on corrugated boxes for fulfillment of Internet sales. Graphics and artwork furnish additional opportunities to connect with buyers, who respond to messages about convenience. Successful packages reflect ease of use and simplicity, appealing to consumers in search of the most convenient products available. And packaging should itself be easy to use, aiding with storage, application, dosing and other consumer needs. Consumers want to see what they are buying, so clear packaging helps satisfy buyers’ curiosity about particular products. But there is more to transparency than presenting crystal clear containers. Shoppers also want quick access to supporting information about what’s inside, including insight into how products are made and facts about the ingredients used in packaged food products. To satisfy buyers’ thirst for knowledge, effective product packaging includes relevant information about the goods it contains. When including product claims on boxes and cartons, the information must be easy to find and understand. And product claims must also be believable, lending credibility to messages packages contain. Rather than filling package surfaces with too much data, some producers are now using on-package QR codes and mobile applications to streamline the appearance of packaging – simultaneously providing quick resources for in-depth product knowledge. Word of mouth and referrals are powerful tools, so effective packaging supports each brand’s efforts to build trust and loyalty. And making the right social impression is essential to building goodwill among hyper-connected customers. Not only do shoppers use smart phones to increase product knowledge and compare prices, but the devices also allow them to share with friends and family through social media. Savvy marketers embrace social media, seeking direct feedback about packaging and other concerns. A packaging change by Eight O’Clock Coffee relied on feedback from consumers, who rated multiple packaging options through Facebook. Despite a promotional sweepstakes designed to solicit public participation, the change was met harshly by some consumers. Users didn’t mince words on social media channels, calling the new package “awful”, “hideous” and “less-than-anemic”. The highly publicized response shows just how powerful social media can be – even when measures are in-place to manage its impact. Successful packagers create social-friendly experiences, using custom QR codes and other interactive features. And since shoppers are more likely to buy products featured on social sites like Pinterest, retailers are also incorporating social media into point of purchase displays. Convenience and social responsibility are important concerns shared by modern consumers, so packaging shifts reflect a new standard. 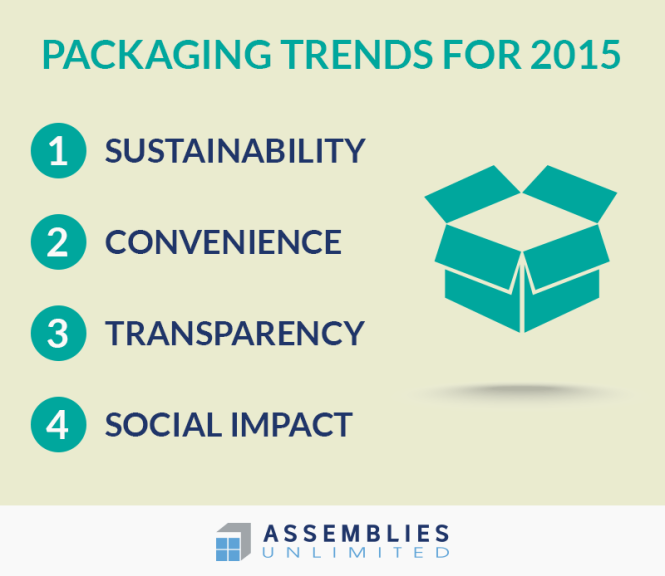 In 2015 and beyond, environmental consciousness and interactive experiences will drive packaging trends, creating unique relationships between consumers and producers. For more information about these and other trends, see these key points drawn from the Contract packaging Association 2014 Conference.